Don't be afraid to showcase your personal style with a little DIY Project. I swear, "Do It Yourself" should be my middle name; growing up with a very (VERY) limited income meant that I could not run to the mall and buy whatever I wanted to fit in with the masses (aka my peers). Growing up (I guess you could say), I had an unique sense of style, and I found out that DIY Projects helped me create unique looks without breaking the bank. 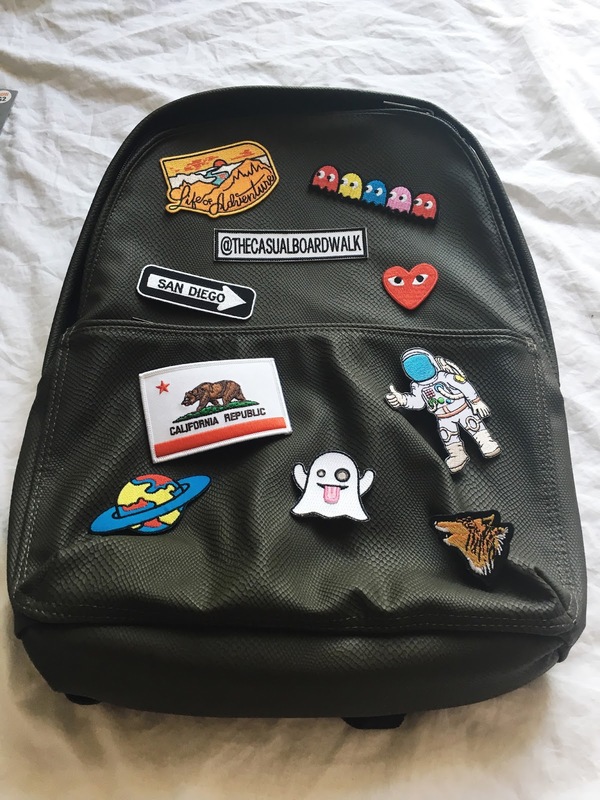 For Coachella, I wanted to rock a backpack that would be both unique and original. 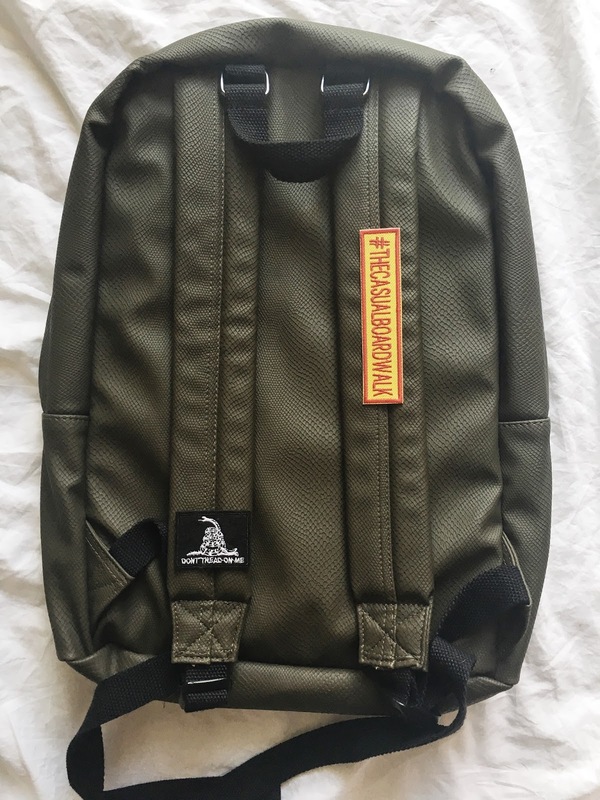 I searched left and right through the internet and by hitting different malls, and I did find the Will Leather Co. "Oaxacan" Backpack...but I STILL wanted something that would represent who I am. 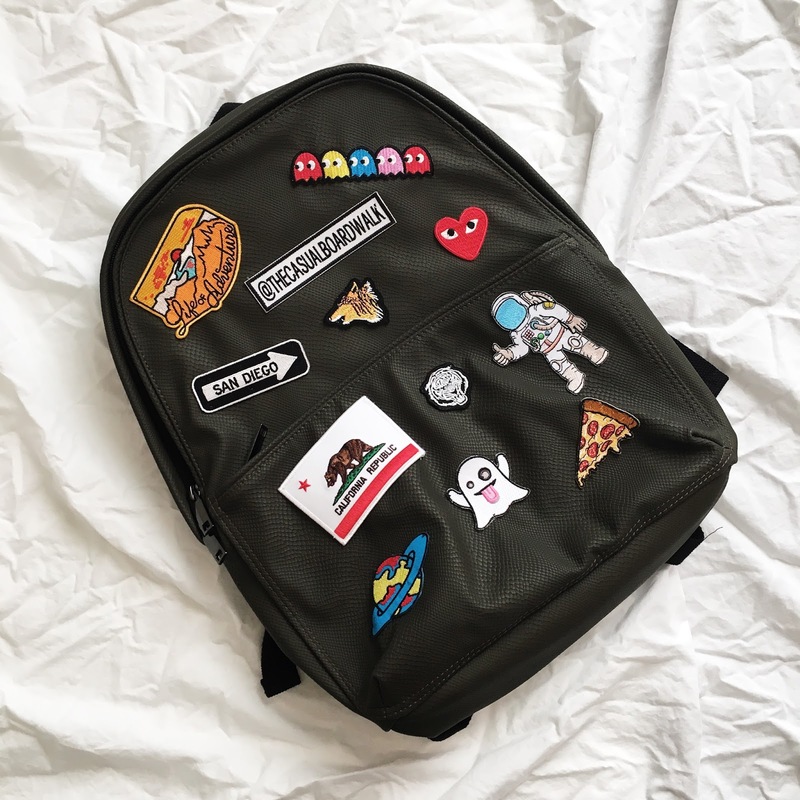 I decided to go for it and I styled my own backpack. I tend to hit ASOS for accessories due to the fact that they offer free 2-Day shipping from the UK to the US and their prices are always on point. I found this pleather backpack on sale for $19: the size, texture, and color were perfect for this project. While I waited for the backpack to arrive, I took out my personal stash of patches and I ordered some through Amazon and Etsy. 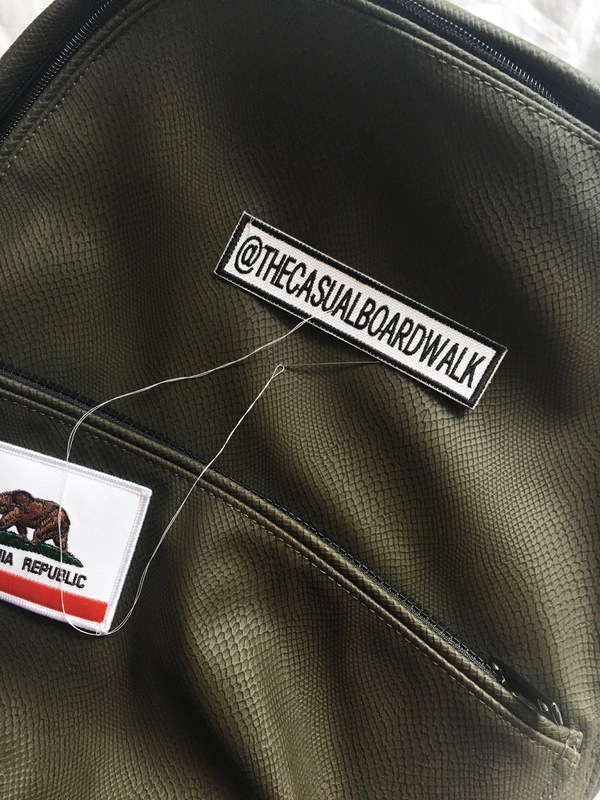 I even had a a couple of patches customized with my Instagram username and the hashtag found in every single one of my photos, #thecasualboardwalk. I decided to purchase patches that represented me; each of them holds a different meaning behind them...such as the Pac-Man patch, I LOVE to play the game any time I hit an arcade. The Ghost Emoji reminded me of Snapchat, and the California Flag patch...well I'm from California, the coolest state ever! 1. Make sure to work in a clean area, and have all your materials in hand. 2. Play around with your patches; try and find the perfect spot for each of them BEFORE you iron or sew them on. 3. I decided to SEW my patches: I could easily iron these on top of the polyester-made backpack (using a blanket on top to avoid burning it), but I wanted to sew them in case I ever wanted to re-use the patches for something else. 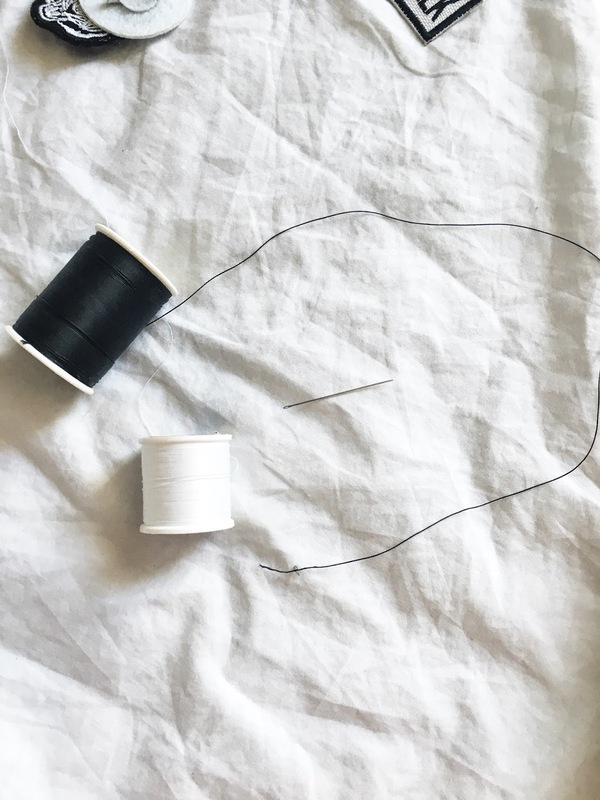 Have a roll of black and white thread and a needle ready, you will see that most patches have white or black incorporated into them, so hiding the fact that these are sewn in should be no biggie. 4. Begin sewing! Begin by sewing around each corner. 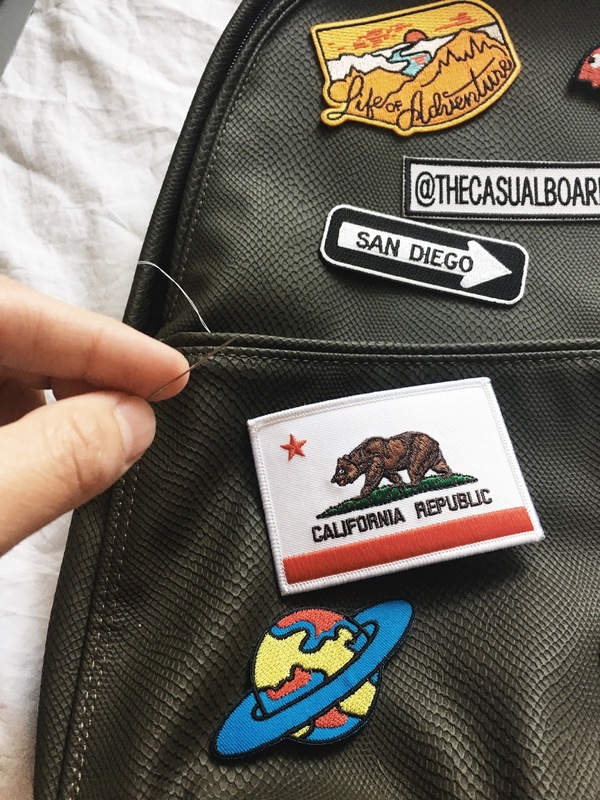 I recommend to begin sewing by first inserting the needle inside the backpack and taking it out on the back side of your patch. Once the thread's outside of the patch,go right back in and move to your next corner. 5. Don't forget about the straps! 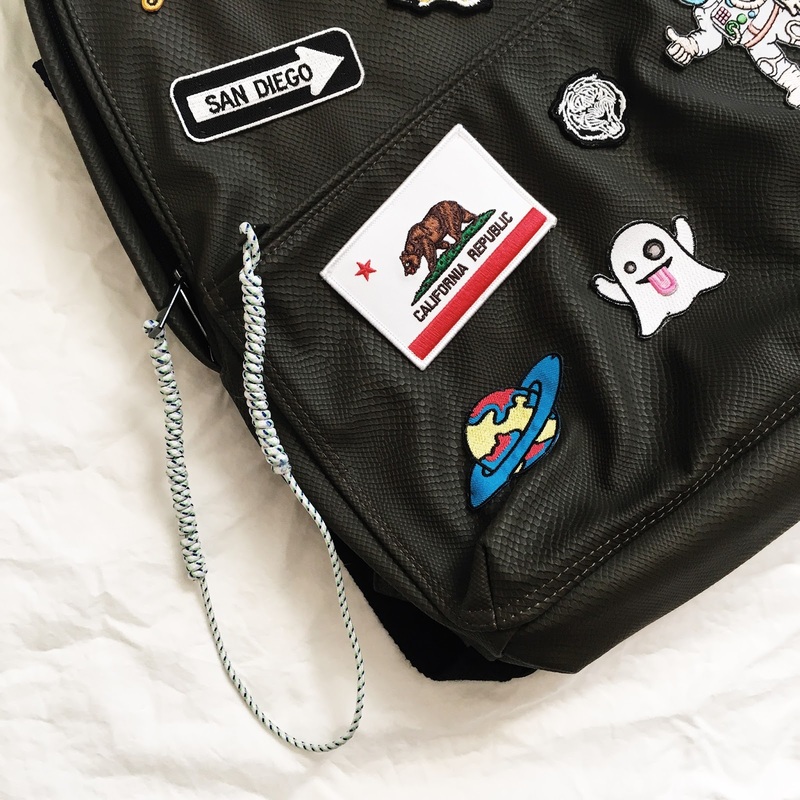 Add some pins or patches to make them look cool! 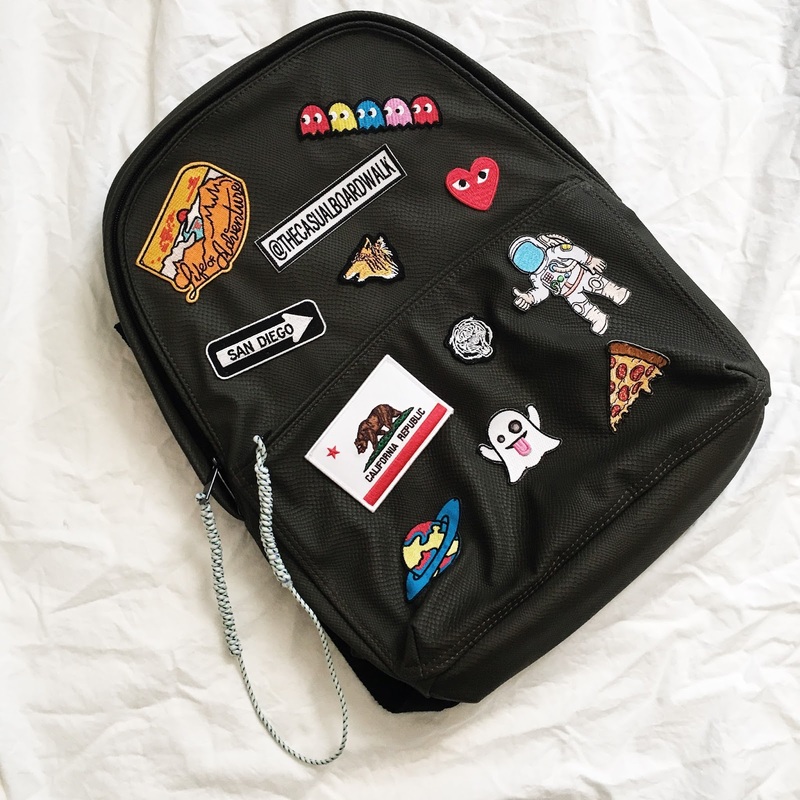 After sewing all your patches, your backpack should turn out into something like this. I had a feeling that something was missing; I didn't know what it was...and then it hit me! 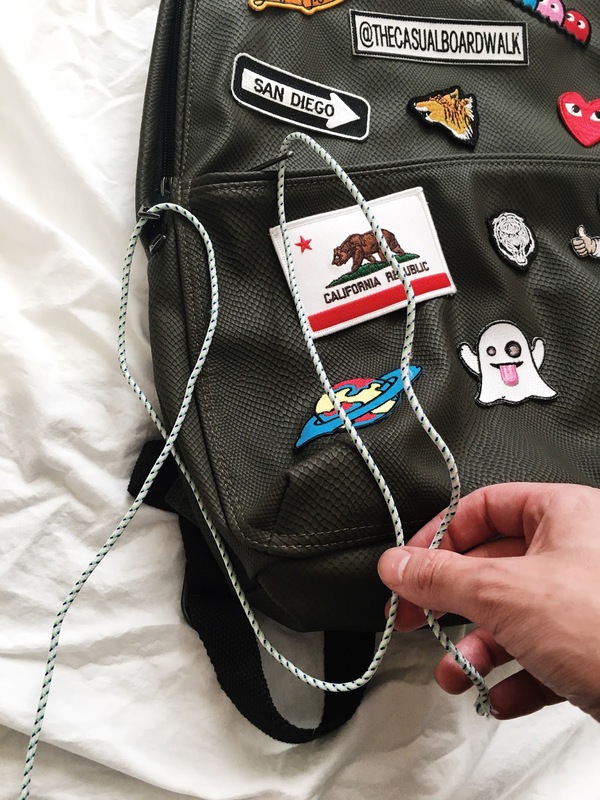 Adding a different texture and color story to the backpack's zippers. A few months ago, my pup Penelope (the newest addition to the family) got a hold of my iPhone charger and decided to make it her chew toy. Thank God the cable was unplugged though! Instead of tossing it, I decided to save it for "something" (yes, you can call me a hoarder). Going through my "supplies" and what not I stumbled across the cable, and I knew it would go great with my backpack. 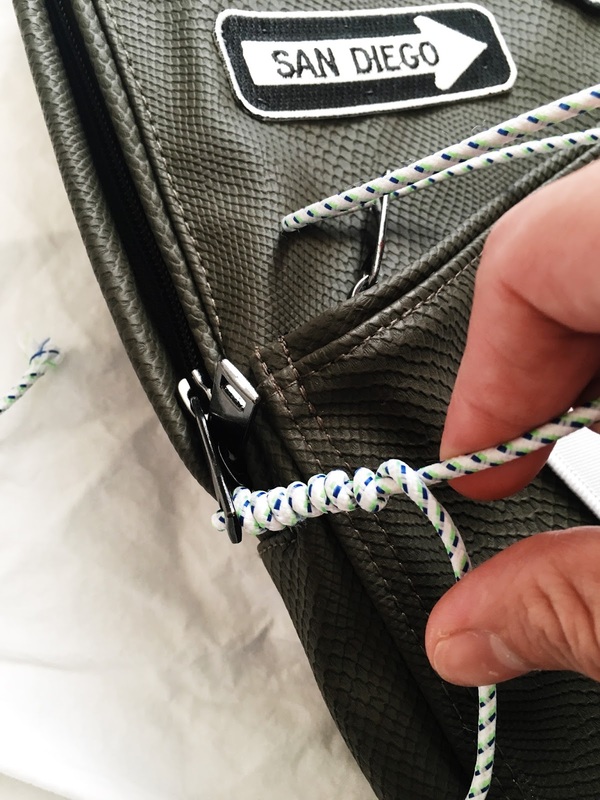 Begin by inserting the cable (or whatever you end up using) through the zippers. 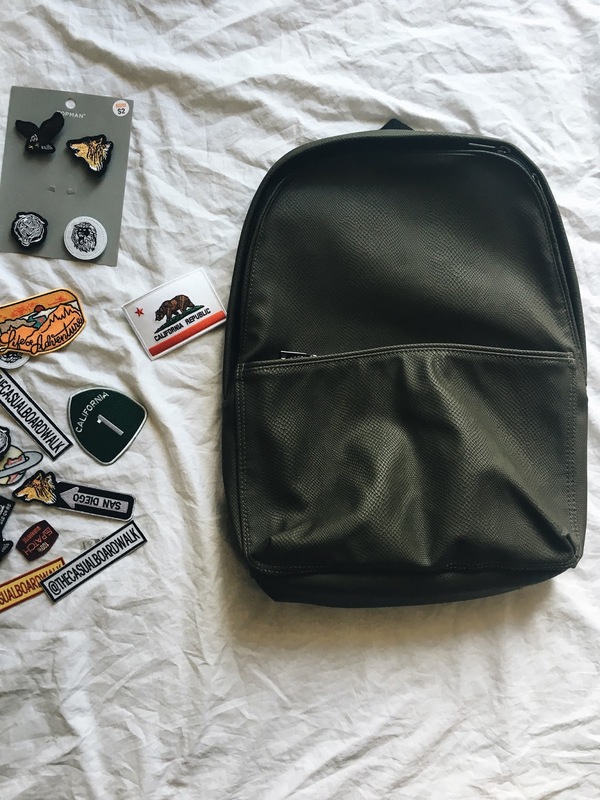 Play with the length that best suits your backpack/needs. I wanted to connect both zippers together to have quick access to my backpack and to be able to make sure my backpack was closed by just pulling the strap. You don't have to cut any excess cable! Make your strap look dope by twisting any excess around your required length. Once you reach the end, add a little bit of hot glue (or crazy glue) to the corners to keep all the twists in place. Annnndddd, this should be your end product, doesn't it look dope? !